Harford Tree is happy to offer both residential and commercial landscaping and tree services. Here at Harford Tree Experts & Landscaping, Inc., we’ve provided the greater Baltimore area with professional tree and landscaping services for decades. Established in 2000, we’ve been providing the great service that you can only expect from a family-owned and operated business. We’ve happily serviced the areas of Bel Air, Fallston, Perry Hall, White Marsh, Middle River, Parkville, and Baltimore City with whatever their tree or landscaping services may be. Read on below to find out the variety of robust services we’re able to offer our clientele. 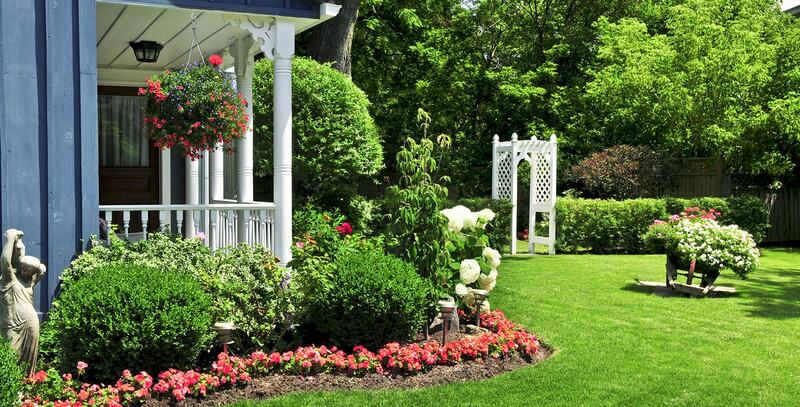 Our comprehensive landscaping services are intended to keep your yard looking great all year round. We’re skilled at tree planting, garden planting, and sod. If you’re unsure of what exactly you want, that’s why we’ve got landscape designers who can walk you through each and every step to be sure that you get the yard you want. How can Harford Tree help you? Not only are trees an amazing sight to add to your yard, they also reduce your energy bills. Some nice shade in the hot summer days can actually keep your whole home much cooler if planted properly. Plus, it’s environmentally friendly and the world needs more trees! We’ll help you choose exactly what kind of trees fit the look you’re going for. Want to attract some beautiful butterflies to your yard? Or maybe you’re just trying to get yourself into the gardening hobby but need some help getting it all kicked off. At Harford Tree, we can help you with the initial planting so that you can enjoy the bountiful benefits of professionally planted flowers, shrubs, and bushes. If you’re not interested in gardening but want to reap the benefits of aesthetically pleasing flowers, we can take care of any future gardening needs you may have, too. Got a new home or just trying to spruce up your current yard? Sod is a great way to make your yard look beautiful without all the issues that come with traditional lawn care. You won’t need to wait for your yard to pop up, meaning you can enjoy your brand new yard immediately. Your yard will grow more heartily and have a higher success rate than traditional seeded lawns, and Harford Tree is happy to help you with every step of the process. Good looking trees require a good amount of regular maintenance. This includes regular tree trimming and pruning services to keep them looking right. Tree branches that aren’t properly maintained can end up being a much bigger problem; problem branches can eventually lead to roof damage or power outages in your home. Luckily, Harford Tree Experts & Landscaping Inc. is here to help with whatever tree maintenance services you may need. We’ve got years of experience removing old, dead, or damaged trees. We can safely and efficiently get your yard cleared of any problem trees. How do you know if a tree needs to be removed? Some trees are obviously dead or dying, but if you can’t tell, you may want to have one of our professionals come assess the health of your tree. Trees suffering from diseases may start to make your yard look worse, whereas damaged trees may actually be dangerous. We can help you determine the severity of your tree problems and remove any unwanted specimens. Storms can quickly take out trees in your yard, causing them to crash down on your home, power lines, driveway, and so on. If you’ve got an emergency tree scenario, you don’t have time to wait for someone to get out there. That’s why Harford Tree offers 24/7 emergency tree services. Don’t be bogged down by the stresses of recovering from a natural emergency, let Harford Tree take the stress off of you. Whether you need hardscaping services for a commercial or residential property, we can help your image become reality. We’re able to offer patios, retaining walls, driveways, pool pavers, and pavers. It’s important to work with a company that understands both landscaping and hardscaping to make sure all of your outdoor dreams come true. We want to work closely with you to figure out exactly what kinds of hardscaping elements make sense with your space. While we love our residential work and helping our customers make their yards perfect, we also do work for the commercial sector. Got a business that needs emergency tree removal, stump removal, or land clearing and excavation? Let us know! If you’ve got an old vacant lot or large areas of land that need to be transformed into usable space, the experts at Harford Tree can help. We’ll do a thorough land clearing, which includes removing any varieties of plant life or tree life that you want gone. Your property will be turned from an unusable space into something accessible and safe that you can use for whatever commercial purposes you may have. We’re familiar with all of the local regulations, so you can be sure we’ll get the job done right. If you’re working on a time limit in your commercial excavation project, we’ll be sure to get the job done when you need it done. We’ve broken ground in all kinds of weather conditions and will keep you on budget and on time. Whatever size or requirements your excavation job may have, we’ll be sure to keep you filled in along the way so you know exactly how the project is going. If your business is moving locations or cutting down on old office supplies, we can provide you with an affordable roll off dumpster service. If you’re remodeling or expanding your property, we can provide construction dumpster services so you can get rid of all of your drywall, flooring, tile, and so on with ease. We can also provide dumpster services for clean-up if you’re doing some major cleaning, or for roofing/siding and yard cleanup. This way, you can be sure to get rid of all the excess that you truly don’t need. If you have need of crane services for your commercial construction project, we at Harford Tree can help. Not only can we provide you with a wide range of crane and lifting equipment and gear, we can also provide the skilled operators who can use them. They’re well-trained experts who know the proper techniques for moving large objects, including trees, off of your property. This entry was posted on Friday, May 19th, 2017 at 1:36 pm. Both comments and pings are currently closed.